The original Zinger herbal tea is a lively blend of hibiscus, orange and lemongrass. “There's no mistaking a Zinger! We introduced Red Zinger in 1972, and nothing around here has been the same since. The zing comes from a blend of tart and tangy Chinese hibiscus and fruity Thai hibiscus, balanced by cool, refreshing peppermint and the unique, earthy sweetness of wild cherry bark. Try this perennial favorite on ice!" Pour freshly boiled water over one tea bag. Steep 4 to 6 minutes and remove tea bag. Sweeten if desired. Pour 2 cups boiling water over four tea bags in a heat-resistant container. Steep 4 to 6 minutes and remove tea bags. If desired, add sweetener while tea is hot. Add 2 cups cold water and chill. Hibiscus, rosehips, peppermint, West Indian lemongrass, orange peel, natural flavors, lemon verbena, licorice and wild cherry bark. Steph "Works great for colds"
I have been using this everytime I have a cold. It has really helped out and it soothes the throat so much. This is a great tasting tea! 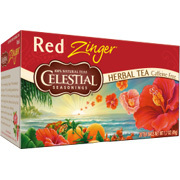 This is my favorite zinger tea that celestial seasonings and it is great! I have been buing this for a really long time now and it is perfect for iced tea in those really hot summer days. I love this tea! Red Zinger Herb Tea Red - 20 bags is shipped in a discrete, unmarked package. Orders are processed immediately and usually takes about 3 to 5 working days to be received. We do ask that you try it for 2 to 3 weeks to feel the full effects. Any information received is used only for order processing and shipping purposes. Your information, such as e-mail address, will never be disclosed to a third party.